Urban Wildlife Trapping Experts is a Professional Pest Animal Removal & Control Company in Southern California. We provide the Best Humane Wildlife Removal Services, Supplies, and Products for Raccoons, Opossums, Skunks, Coyotes, Feral Cats, Squirrels, Rodents, Rats, Mice, Gophers, Moles, Snakes, Rattlesnakes, Birds, Pigeons, Sparrows, Hawks, Bats, and Bee Control. Often we find these types of animals in the attic, under the house or deck. Sometimes an animal under the house can even get into your attic through the walls. Animal trapping is the best method or removal and prevention. Our animal traps are safe and nonlethal traps. 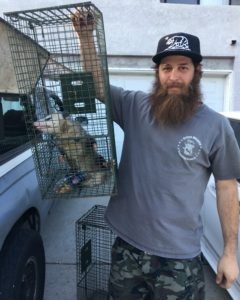 We also provide dead animal removal services for Los Angeles Animal Removal, Orange County Animal Removal, Riverside County Animal Removal, and San Bernardino Animal Removal... Urban Wildlife Trapping Experts can help you with All Animal Removals, All Animal Feces Removal, and Prevention Services. We also offer a wide variety of wildlife & bird control supplies. We are here to help you, so give us a call to discuss your wildlife control project or services with us today. Every job includes a full inspection of your property, followed by Humane Animal Removal Services that fit your specific situation. Our professionals can clean up & sanitize all animal feces in your attic or crawlspace. Need new insulation? We can do that too. This saves you time & money. We can help with protecting your property against wildlife invaders. We use the latest techniques available & do all this at a great cost too. Urban Wildlife Trapping Experts Operates Safely & Humanely! Urban Wildlife Trapping Experts are the wildlife professionals you should choose for all your pest animal removal and control of: Raccoons, Opossums, Skunks, Coyotes, Feral Cats, Squirrels, Rats, Mice, Gophers, Moles, Snakes, Birds, Bats, and Bees. We are also good at Locating Dead Animals and Remove Bad Animal Odors. Wild Animal Are Dangerous & Will Attack!! Raccoon Control. 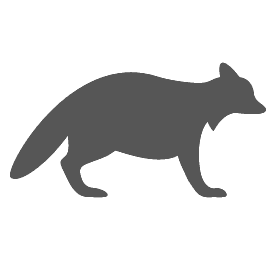 Our professional experts that specialize in raccoon trapping and raccoon removal services. Common raccoon calls we receive are for raccoons inside the attic, raccoons living in the crawlspace, a raccoon with babies inside the attic or crawlspace, raccoons tearing up gardens, raccoons rolling back sod, raccoons pulling back vents, and finding of raccoon latrines on the property. We come across homeowners with these raccoon issues every day. Our company is committed to assisting in resolving any raccoon problems by humanely trapping and removing the raccoons. Opossum Control. 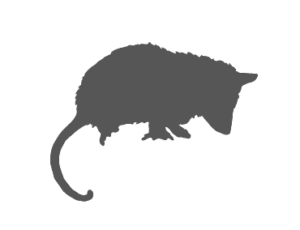 Our professional experts that specialize in opossum trapping and opossum removal services. Common opossum calls we receive are for opossums inside the attic, opossums living in the crawlspace, opossums inside the garage, opossums with babies inside the attic or crawlspace, opossums pulling back vents, and opossums causing major flea problems on the property. Dead opossums or live opossums are known for carrying a lot of fleas. If you find yourself with a sudden flea problem on your property, opossums on your property are most likely the culprit. Our company is committed to assisting in resolving any opossum issues by humanely trapping and removing the opossums. Skunk Control. Our professional experts that specialize in skunk trapping and skunk removal services. Common skunk calls we receive are for skunk burrows, skunks living underneath homes, skunks living inside garages, skunks pulling back vents, skunks with babies living inside the garage or underneath homes, and skunks causing major flea problems. Skunks do carry a lot of fleas. If you find yourself with a sudden flea problem on your property, skunks on your property are most likely the reason why. Studies show that skunks do return to where they were born to nest and have her baby skunks around spring time. Rodent Control. We specialize in rodent trapping and rodent removal services, Like rats and mice problems. You may hear scratching noise in the attic or walls, but they are just gnawing on the wood to grind their teeth down because it does not stop growing. We do not use rat poison because you may have a dead rat in the wall or kill predators with the poison they digest. These rodents can get into areas where only their heads will fit due to their soft cartilage. We offer trapping service, clean up services and prevention. Squirrel Control. 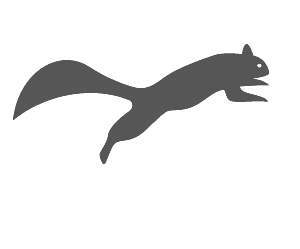 We are experts that specialize in squirrel problems and squirrel removal in Los Angeles County, Orange County, San Bernardino County, and Riverside County. The Squirrels, throughout the western part of the United States. Squirrels are considered rodents that weigh in about 1 pound, measuring from 12-18 inches from nose to tail. They love to feed on fruits, nuts, seeds, fungi, etc. Ground squirrels can be found nesting in burrows. We services Los Angeles and Orange County for Squirrel Removal. "Learn More"
Bat Control. We are experts that specialize in handling bat prevention and control. Bat control in Los Angeles County, Orange County, San Bernardino County, and Riverside County includes bat removal, bat extraction, and bat exclusion by repairing any points of entry. Every situation is different. Some property owners might call about a bat that has flown inside of the building and needed us to come out to locate to capture and remove the bat properly. Others may encounter a more severe case where bats infest their attic, walls, roof tiles, etc. Bats can pretty much nest in any tight and enclosed areas where they are not vulnerable to predators. Usual signs of bat infestation include bat feces around the perimeter of your home or building. 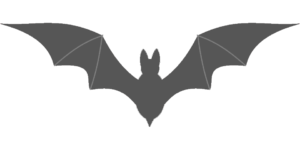 Other signs of bat infestation are body oils the bats leave behind at their entry points. Snake Control. We are experts that specialize in snake trapping and snake removal. 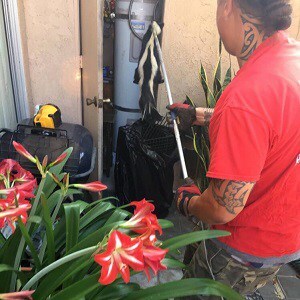 Snake removal in Los Angeles County, Orange County, San Bernardino County, and Riverside County. 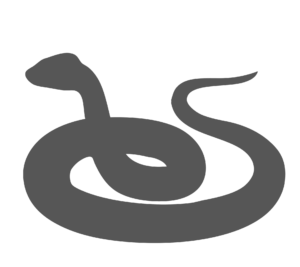 Our snake experts can remove snake, like rattlesnakes, rat snakes, gopher snakes or exotic snakes. includes full snake inspection of commercial, business, and residential properties and rattlesnake removal. Full snake inspection includes searching for any snake dens, possible attractions that cause the snakes to be on your property, and any future snake prevention. Rattlesnakes can strike up to half their body length in 1/25 of a second! Our best advice is to let the professionals safely identify, capture and remove any unwelcome snakes. "Learn More"
Bird Control. 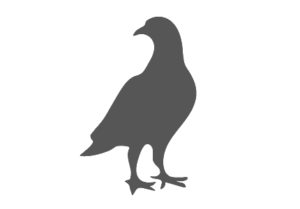 We offer professional bird control methods such as trapping services, bird waste clean up services, bird prevention and Ovo Control (birth control) for some bird species. All birds roost and drop bird poop everywhere. They often nest in areas hard to reach and difficult to clean and remove. Birds and feces can carry disease that can be very harmful to us. Some bird feces and nesting sites will also carry bird mites that could potentially be harmful to your health. Our bird control experts are certified by Bird Barrier. Our professional wildlife bird control specialists seal these and other potential entry points with materials designed and manufactured to exacting specifications. We install deterrents (Bird Spikes, Bird-Coil, Flex-Track, BirdSlide, Eagle Eye & Stealth Net) to help keep birds (OFF or AWAY) from your property for good. We use the latest Bird Barrier Products on the market. Some bird repellent sprays and homemade repellent sprays do not work effectively. Coyote Control. 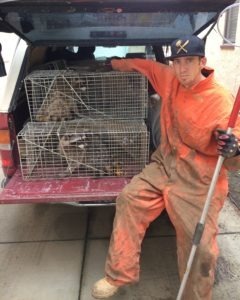 We are professional experts in coyote trapping and coyote removal services. Do you see coyotes jumping the wall into your yard? Or You have seen coyotes stalking your pet or small child?. Maybe coyotes are nesting in a nearby den. Yes, coyotes can become a threat to you and your family. Tired of dealing with coyotes? If that is you, then my coyote control company can help solve your coyote problems for good. We have the experience and know how to make your property free of coyotes. We services Los Angeles County, Orange County, Riverside County, and San Bernardino County for coyote Removal. Gopher Control. We are experts in gopher trapping and gopher removal services. Gophers usually become a nuisance in the inner cities. These pesky gophers are labeled as a nuisance pest due to their destruction and presence on private properties. Feral Cat Control. We offer professional experts that specialize in feral cat trapping and feral cat removal. 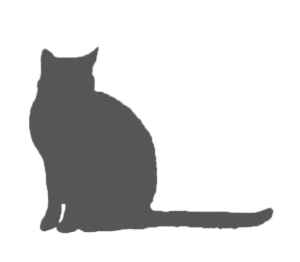 Common feral cat calls we receive are for feral cats living in the crawlspace, feral cats inside the garage, feral cat with babies inside the attic or crawlspace, feral cats pulling back vents, and feral cats causing major flea problems on the property. Dead feral cats or live feral cats are known for carrying a lot of fleas. If you find yourself with a sudden flea problem on your property, feral cats on your property are most likely the culprit. Our company is committed to assisting in resolving any feral cat issues by humanely trapping and removing the feral cats. Bee Control. Removing bees can be a bit difficult. 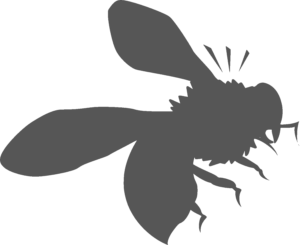 Some hives remain hidden, and can get large in size without knowing. Bees will build hives in locations are dry and sheltered. Sometimes at higher locations making them more difficult to remove. In defense, bees will sting if you get too close to the hive. When this happens, many people wish to have the nuisance animal trapped and removed by a professional wildlife trapping and removal company. Urban Wildlife Trapping Experts is the company for you! We know how to get rid of pesky wildlife from your yard, crawlspace or attic. We are nuisance wildlife removal & control professionals. Same day service, or next day & every day of the year offered. There are no free animal control or animal removal services. 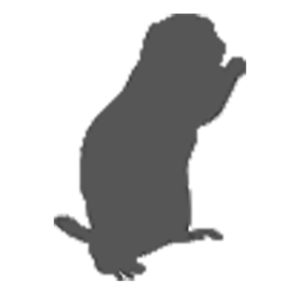 Below is a list of animal removal and wildlife management services we offer. Wildlife Removal Service Area's: Los Angeles County, Orange County, San Bernardino County, and Riverside County. Urban Wildlife Trapping Experts strives to deliver the best in wildlife control quality, low-priced animal control services and wildlife prevention for customers in need of services. Call us today for a free price quote on animal control, animal trapping, animal removal, and dead animal removal. Also, ask about our exclusion services. Humane Animal Trappers!!! We always operate safely and humanely when it comes to removing wildlife from your property. Need help with removing Opossum that has gotten into your attic, wall, crawlspace, or property? We offer the best methods of humane animal removal. We can remove all wild animals from your home or business location. Our process is always safe, humane, and nontoxic animal removal. Our trained wildlife technicians use a professional process to remove and secure your home or office from nuisances wildlife today and in the future. It starts with your phone call and we will thoroughly listen to your wildlife problem. Every situation is different, so we will ask appropriate questions to help us understand the situation better. Questions like, "do you hear the noises at night or during the daytime?" or "what type of roof do you have?" After we have an overall idea of your wildlife problems, we can provide a rough price range, and schedule a same-day or next-day appointment to inspect your property. The first step Urban Wildlife Trapping Experts takes is doing a thorough inspection of your property. It is important we find wildlife or rodent evidence to help us better understand your problem and the animal's behavior. Our professionals can identify different types of animals by inspecting their fur, footprints, feces, nest or any other signs of animal activity. 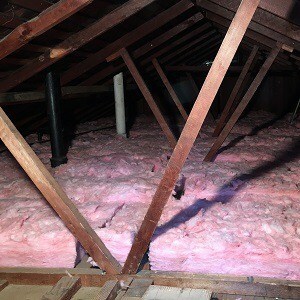 Your roof is the most likely entry point into your attic for most animals seeking shelter. We also can check under your house or deck; this is another common area we find animals nesting. We usually find smaller rodents in the wall, like rats, mice, and squirrels. During our inspection, we look for weak points on your property. All mid-level areas, such as dryer vents, siding gaps, first-floor eaves or dormers, etc. Once we understand what animal species we are dealing with, and the problem, we use the most effective means of removing the animals. We use dozens of different types of traps. Trapping - If trapping is needed, we trap animal(s) in live cage traps. We set up traps that are designed and will target for your pest animal type. Urban Wildlife Trapping Experts does not believe in poisoning animals or euthanizing wildlife. Our experts only use the safest animal removal methods and techniques available. For most animal removals we use humane animal traps. These traps are designed to capture wildlife safely without harming the animal. In some cases, we can apply a pheromone scent in the attic, wall, or crawl space. We mainly use pheromone for female raccoons with baby kit raccoons. Locating all holes leading into your structure would give us a better map what needs to be sealed up once all animals have been removed. When our wildlife removal experts are on your roof or in your crawl space, they locate the exact entry point which the animals are using. These entry points are often small holes, broken vents, or weakened exterior walls. Finding these entry/exit points is an important step in the wildlife removal process. Repairs are a crucial step in the wildlife removal process. In many cases, such as bat or rodent control, the job cannot be performed without detailed repairs, and in all cases, sealing the entry holes shut ensures that no future wildlife will ever enter your home. 100% of the entry holes must be found and sealed shut, or the job is not complete. Our technicians will offer to repair your most vulnerable and damaged areas in your home. This can save you future repair bills, headache, and protect your family from diseases. Ask about our repair warranty for Animal Exclusions & Repairs. Repairing your home from all future animal infestations. It may be desirable to clean your attic after we've removed the animals. They can leave behind large amounts of droppings, urine, hair, oils, food, nesting material, and so on. These remnants can attract insects like cockroaches, and the scent left behind can encourage new animals to chew their way into your house. You might experience odor problems from the waste. It's possible that mold will grow in waste areas. The above is just a brief explanation of some of our methods. I haven't even addressed the hundreds of other potential cases that we deal with, from bat exclusions to poison-free rodent control, to dead animal removal, bird roosting prevention, mole trapping in a yard, ground-based exclusion barriers around a shed, etc. etc. Just give us a call anytime, and we can describe in detail how we will resolve your specific wildlife problem. Things like rats, bats, and snakes belong outside, thriving in the wild. So why do they end up in our homes? There are many of reasons for this: shelter, food, a place to nest. Maybe the weather got too hot or cold for them and your home seemed the easiest to enter undetected. Whatever your case may be, we've got you covered. 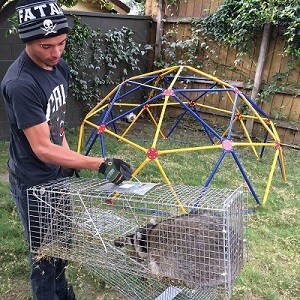 We handle simple things like inspections and we also do the hard stuff, like trapping, removing, and repairing the damages caused by wildlife in Los Angeles, Ca. I saw two skunks on my patio a couple of nights ago, then last night I went into the back yard and saw them go into the crawl space under the house - apparently the cable installer didn't close it up sufficiently. Called Urban Wildlife, David gave me an exact quote and said he'd have a technician call me. Chris called five minutes later and said he could be at the house in 20 minutes. He crawled under the house, did a through inspection, and luckily for me the skunks weren't under there. He closed up a couple of areas where critters might get in and was gone in about 30 minutes. Thanks! Chris is my hero!!! I called yesterday on Valentine's Day and he came out the same day after 3 other appoints in opposite ends of Los Angeles! A skunk has been living under my house in the crawl space spraying the heater and charging at me when I leave at 5 AM for work, for the last couple of months the skunk has became more aggressive. Our cat got into a fight with the skunk scratching our cat's face and spraying her. 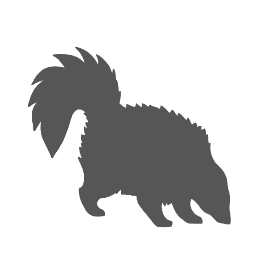 I was at my wits end with this skunk. Chris trapped her after an hour of her playing a game of coming out only to enter again. Once caged she sprayed but he noticed she was pregnant and realized why she was so aggressive, he took her with him to relocate her since to have her babies in the wild and agreed she would come back if he only scared her out. Words cannot express the anxiety and stress Chris took off my shoulders. Thank you!!!!!! Stop reading these reviews and just call them. Came within 90 minutes, helped scour our house for the funky smell. When Chris could not find anything, charged us less than the quote. Instant add to our "House Vendors List". We have used these guys for years with excellent results. Jonathan is always available and provides excellent service. We wont use anybody else. Excellent service. We had squirrel trapped in our fireplace. They quickly scheduled a time and captured and released the squirrel. I'm so glad I found this place! I found a weird and very intricate nest hanging on a wire on my balcony late at night. We couldn't figure what it was and had all types of guesses going, which set us into panic mode. I found Urban Wildlife Trappers online and called them around 11pm. Monica was very helpful with getting things started for me. They were able to tell me what it was based on a picture I sent them. It turned it to be a hummingbird nest (felt pretty silly), but because it was sitting on a wire, I thought it would be best if it was removed. The next morning Rio got in touch with me and gave me some great options on what to do. When he arrived, he took care of things very quickly and charged us less than quoted. So great to work with honest and genuine people! Thank you Rio! So I've been hearing birds in my attic for the past week or so. I called Jonathan and Chris to come check out my home. They came about an hour after I contacted them and they inspected my house. They quickly targeted the problem areas in my attic, which were several openings along the base of my attic and top of the roof. They began to go to work almost as soon as they arrived determining that sparrows and pigeons we're frequenting my home. They cleaned up any leftover animal waste, sanitized the affected areas, extracted any old nests, and set up some animal prevention barriers to patch up all the holes. They did it in a timely manner and we're very professional. Would recommend to anyone. Thanks Again! I rent a home in North Hills, CA. At night for a couple months now, we've been hearing scratching noises and just heavy steps on our ceiling. I called my landlord and they sent someone to see what is up in our attic. It ended up being a possum! So they ended up hiring Urban Wildlife Trapping Experts. Saani called me and made an appointment to come by the same afternoon. I have a 4 year old son and a 3 month old and he was very friendly and polite to us and our kids. He came into our house and spent a great deal of time fighting this very stubborn possum. It was a female and mentioned that she must be pregnant by the way she was fighting him. However, he was able to grab her and close the trap so no other predators would be able to come in. Thank goodness! He explained everything we needed to know and answered all our questions. He did such a great job and would highly recommend using them and referring to any friends or family that needs their service. Very courteous and accommodating service. Response time was good and reasonable pricing for a skunk removal. Thank you! Thank you to Sanni for a seamless job. We caught another skunk and he removed it without having the skunk spray. Awesome! During Easter weekend we discovered a visiting family of opossums taking residence in our garage. We called Urban Wildlife Trapping Experts and they called us back promptly. Trapper Saani was professional and used care removing our visitors. 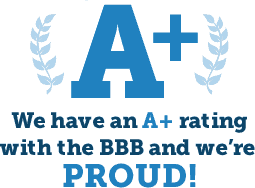 We highly recommend them and were very pleased with their promptness and customer service!!! Jonathan and Mike did a fantastic job trapping the skunks that were hanging out around my house recently. Very easy to work with and were extremely professional and courteous. I would highly recommend them for removing any Critters!! My landlord contacted this company because we had been hearing a lot of noises on our roof. Matt came out right away and set traps. He was very helpful and explained everything. The very next day I called him because we had caught a large possum...gross....he came out right away and picked up the possum and explained a lot about it. He then left more traps. Matt was always available early in the morning when we needed him to come get the gross rodents out of our yard in their cage. We've caught two so far and we can still here one roaming around. Thanks Matt! I had a gopher that was destroying my back yard I called this company the owner personally responded he came out on a rainy day set the trap and in a week came back and removed the dead gopher. He is in my opinion the best at what he does and is worth the money. I paid him $150 and he saved my back Yard. I would use him again in the future. Chris and his partner (so so sorry I didn't get his name) are my heroes!! I trapped a skunk instead of the mean tom cat I am targeting. It was fascinating to watch them transfer from my cage to theirs. I'm also so pleased to hear that they catch and release somewhere else. Chris gave me great pointers on catching the mean cat, too. They are also very friendly and easy to work with. You guy's are the best!! I want to thank Jonathan and his great team. We called because of a horrible smell as skunks were spraying under our house built in the 1920's. There was a crawl space opening under the property that was not repaired. The skunks were seen going in and out and spraying just a few feet below us. Sure enough I called Jonathan and his team. They were prompt, through and truly went the extra mile. We did get one of the skunks from under the house in addition to one that died under there. His team came out and ensured under the house was sanitized and clean, and in addition sealed and secured the opening. I am very grateful for such a hardworking team of professionals that got us through the trying time of having our home smell like skunk right below us. I recommend Jonathan and his team to anyone. Fast response time and good overall customer service. After getting quotes from several other service providers they were by far the best deal in town! Jonathan was very genuine and though I hope I don't have to contact them again...I wouldn't hesitate if I needed to. Thanks again! Trapper John and his team are very accommodating and very nice. Saani and Rio have helped us with our raccoon problem. We've caught 3 so far and there seems to be just 1 left. We're glad we called and glad they're able to humanely help the little guys. We don't want to hurt them, we just don't really want them in the house. Urban Wildlife has been really great! Called up Urban Wildlife early in the morning, they were able to accommodate my working schedule and come after 6PM same day! Rosan? I am not sure if I spelled his name right but he came through and was incredibly personable and professional. Not only that, he was extremely efficient as well. He was able to grab this possum I had stuck in my garage with his BAREHANDS!! Put the possum in a cage and drove off in to the sunset to find her another home. We had a bird fly into our home and perch 30 feet above the floor on a beam in our entrance hall. I called Johnathan at 6:15am on a Sunday morning and they had a technician out to our house within 90 minutes. They safely removed the bird, not injuring it and also being VERY careful of our home's furnishings, walls and floors. They were so professional and they saved us! Without a doubt, a great company with experts. We've used Urban Wildlife on two separate occasions. Both times Jonathan has been fantastic. If you need to get rid of skunks, Jonathan is the guy! We had a potentially very tricky situation when a mama raccoon had babies in our attic. We could hear the chittering and chirping of the babies right over our heads in the bedroom, lots of scratching and scuffling. We popped out heads up through the trap door into the attack and there she was, an enormous female hovering over her litter in the far corner in a narrow crawl space. Even though it was late on a Sunday evening these guys got right back to us and sent Mike out the next morning, The Mike was on time, knowledgable, humane, knows his craft. The plan was to do pheromones first so she would move them on her own. Turns out she had moved the babies in the night, possibly spooked by us. Mike did a thorough perimeter inspection and sealed the entry ways. Super professional. Fair price. Quick response. I would call them again for critter issues. What a fantastic group. Thought I had a rat in my wall. Noisy at night, and then I heard more then 1. Waited thinking it would move on, not really into killing little animals. Called these guys and they came out the same day. Checked around didn't see anything so we thought it had left. Then more noise, they come back and recheck. We bust a hole in the wall, wham a raccoon baby paw comes out. Wow! So glad I called these experts, solved my problem and no animals were harmed! We Can Handle Any Animal DEAD or ALIVE!